YEREVAN (Armenpress)–"Armenia does not have any objections to the simultaneous accession to the Council of Europe with Azerbaijan but is against making its membership conditional on Azerbaijan’s membership," announced president Kocharian during a meeting with the heads of the diplomatic missions from the Council of Europe members–accredited in Yerevan. Noting that Armenia is on the eve of becoming a Council of Europe member and that this issue is scheduled to be discussed at a June 28 plenary session of the Council of Europe Parliamentary Assembly in Strasbourg–president Kocharian said it was necessary to once again present Armenia’s official position on this issue. As Kocharian’s press office reported–the president reconfirmed Armenia’s resoluteness to become a full member of the European family and said that the process–begun back in 1996–has entered its final stage. Over these four years–consistent and serious work has been done and essential steps have been taken to bring Armenian legislation into line with the European standards–Kocharian said stressing that both the authorities and the political forces share the same position concerning the commitmen’s Armenia has assumed to become the Council of Europe member. 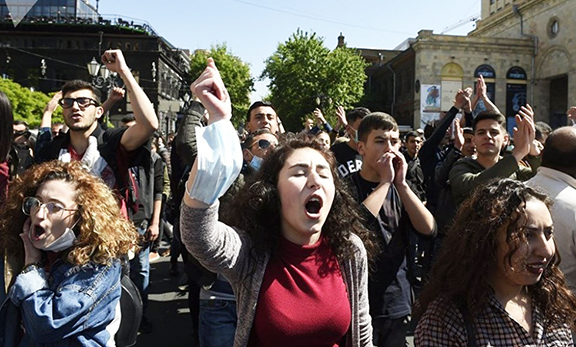 The Armenia’s accession to the Council of Europe has widened the range of commitmen’s it has taken upon itself–however they are a key factor for the strengthening of the democratic process and making them irrevocable–Kocharian underlined. Addressing the diplomatic corpse–president Kocharian said that his government was expecting active support of the Council of Europe member countries to Armenia’s accession to the respected human rights organization. The participants of the meeting welcomed Armenia’s desire to be integrated in the European nation’s family. They were unanimous with president Kocharian that Armenia’s accession to the organization should not be linked artificially with Azerbaijan’s membership.